Have you ever wanted to look into an active volcano? Then take the Crater Rim Drive Tour at Hawaii Volcanoes National Park and drive along the summit caldera of the shield volcano, Kilauea. Does the thought of looking down into a vat of boiling lava get your heart racing? On the island of Hawai`i at Hawaii Volcanoes National Park, you will have the chance to see an active volcano up-close as well as the devastation it has caused the numerous times it has erupted over the past 50 years. 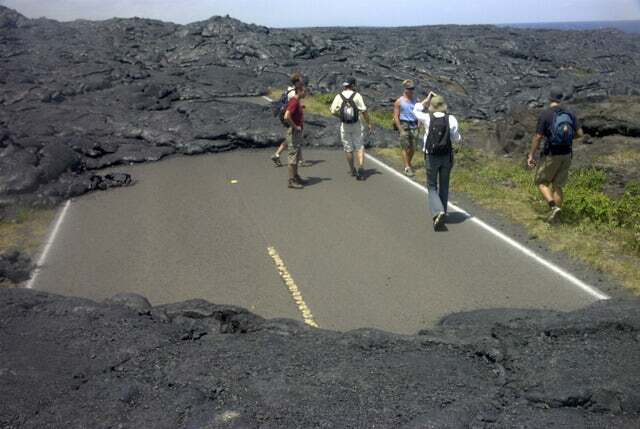 There are several tours that take visitors up close to the center of Kilaueau Volcano, but the Crater Rim Drive ran by Hawaii Volcanoes National Park is the most informative and thorough. Your tour will start at the Hawaii Volcanoes National Park Visitor's Center where you will meet with your tour guides and go over important safety precautions before you begin exploring the summit. Next you can head to the trails as you walk along steam vents and sulphur banks, where the toxic gases are being released from underground. Drive to the crater overlook where you can look down at Kilaueau and imagine what it must look like during a full eruption. The Thurston Lava Tube is the next stop where you can see a cave that lava once flowed through. Head to Devestation Trail and see the effect of the 1959 eruption. The Crater Rim Drive at Hawaii Volcanoes National Park is one of Hawaii's biggest attractions, and shouldn't be missed by any nature or adventure loving traveler. To book your Crater Rim Drive Tour at Hawaii Volcanoes National Park, call us today.